The Automatic Identification System (AIS) is a short range coastal tracking system used on ships and by Vessel Traffic Services (VTS) for identifying and locating vessels by electronically exchanging data with other nearby ships and VTS stations. 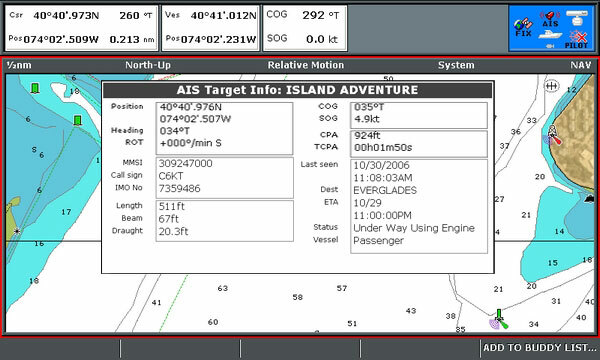 Information such as unique identification, position, course, and speed can be displayed on a screen - either a chartplotter or on an AIS-integrated VHF radio. AIS is used in navigation primarily for collision avoidance. Due to the limitations of VHF radio communications, and because not all vessels are equipped with AIS, the system is meant to be used primarily as a means of lookout and to determine risk of collision rather than as an automated collision avoidance system, in accordance with the International Regulations for Preventing Collisions at Sea (COLREGS). 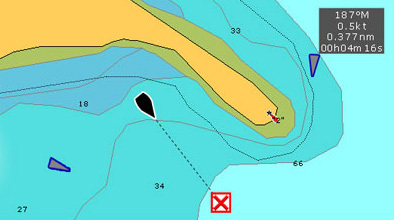 When a ship is navigating at sea, the movement and identity of other ships in the vicinity is critical for navigators to make decisions to avoid collision with other ships and dangers (shoal or rocks). Visual observation (unaided, binoculars, night vision), audio exchanges (whistle, horns, VHF radio), and radar or Automatic Radar Plotting Aid (ARPA) are historically used for this purpose. However, a lack of positive identification of the targets on the displays, and time delays and other limitation of radar for observing and calculating the action and response of ships around, especially on busy waters, sometimes prevent possible action in time to avoid collision. While requirements of AIS are only to display a very basic text information, the data obtained can be integrated with a graphical electronic chart or a radar display, providing consolidated navigational information on a single display. AIS was developed with the ability to broadcast positions and names of objects other than vessels, like navigational aid and marker positions. These aids can be located on shore, such as in a lighthouse, or on the water, on platforms or buoys. The US Coast Guard suggests that AIS might replace RACON, or radar beacons, currently used for electronic navigation aids. The ability to broadcast navigational aid positions has also created the concept of Virtual AIS, also known as Synthetic AIS or Artificial AIS. The terms can mean two things; in the first case, an AIS transmission describes the position of physical marker but the signal itself originates from a transmitter located elsewhere. For example, an on-shore base station might broadcast the position of ten floating channel markers, each of which is too small to contain a transmitter itself. In the second case, it can mean AIS transmissions that indicate a marker which does not exist physically, or a concern which is not visible (i.e. submerged rocks, or a wrecked ship). Although such virtual aids would only be visible to AIS equipped ships, the low cost of maintaining them could lead to their usage when physical markers are unavailable. For coordinating resources on scene of marine search & rescue operation, it is important to know the position and navigation status of ships in the vicinity of the ship or person in distress. Here AIS can provide additional information and awareness of the resources for on scene operation, even though AIS range is limited to VHF radio range. The AIS standard also envisioned the possible use on SAR Aircraft, and included a message (AIS Message 9) for aircraft to report position. To aid SAR vessels and aircraft in locating people in distress a standard for an AIS-SART AIS Search and Rescue Transmitter is currently being developed by the International Electrotechnical Commission (IEC), the standard is scheduled to be finished by the end of 2008 and AIS-SARTs will be available on the market from 2009. For most coastal and offshore navigation, a AIS receiver is typically all one needs to make better navigation and collision avoidance decisions - you will be given plenty of data from all ships (exceeding 300 tons, as well as other voluntary vessels transmitting AIS data) in your proximity. The range is limited by the VHF capabilities of the sending party, usually 20 nautical miles, though data can be sporatic outside of the 10-mile mark. A stand-alone AIS receiver must be hooked up to a VHF antenna to receive data, and data will be displayed on your chartplotter. Communication normally uses NMEA/Seatalk. This diagram seems sophisticated but in reality is quite easy to set up. The Raymarine AIS250 receiver receives signals from your VHF antenna and is used as a hub to your VHF radio (in turn incorporates DSC transmissions). The receiver is connected to an E-Series chartplotter to display the data. 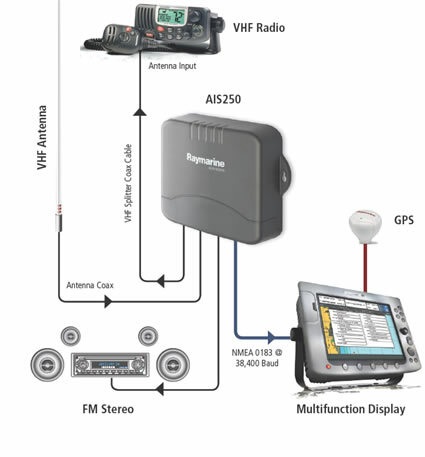 You may connect your stereo system to the AIS250 (shown in diagram) if you wish to use your VHF antenna as an tuning antenna. There is another option available! There are now Fixed Mount VHS radios which not only have a AIS receiver built-in, but as well integrate an LCD display showing nearby targets. This can be a very affordable option if you need a new VHF system already! messages. Since this often causes a flashing screen to pop up at their navigation system, you may have more luck communicating with cargo vessels this way rather than hailing over VHF - especially when language barriers exist. AIS will eventually be standard equipment for just about every ocean-going vessel. Overall, AIS is an excellent alternative to radar to determine which ships are on your track - and uses far less electricity. If you are crossing an ocean or sailing in a high-traffic region, you will simply love AIS. Resources: Wikipedia, Raymarine, Clive Webber. If you have further questions about AIS, do not hesitate to contact us!